2017-18 High School Winners Showcase – Virginia Outdoor Writers Association, Inc. The Virginia Outdoor Writers Association (VOWA) is very proud of our 2017-2018 VOWA-Dubby’s Fishing & Hunting High School Winners who typify both scholarship and love of the outdoors. These outstanding young people, along with all the fine students who entered our contest, are the future communicators and stewards for our precious outdoors. We present these winners with their winning essays linked to each title. Enjoy! 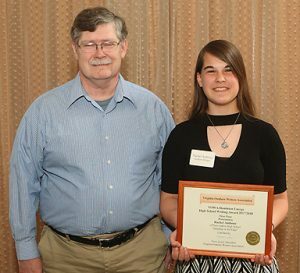 Rachel, a student at Point Option High School in Newport News, Virginia, was awarded first place for her essay titled, “Standing on the Edge.” Rachel loves science and an outdoor English class in which she is enrolled at her school. After graduating from high school, she plans to join the Air Force Reserves and then study meteorology in college. Her goal is to work for NASA. She has always been fascinated by the beauty of nature and loves to learn and explore. Rachel describes herself as someone who strives to do as well as she can in her studies so she can learn and remember as much as she can. Rachel tries her best to show kindness to others and loves to be around her friends and family. 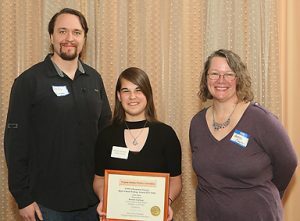 Rachel was accompanied to VOWA’s Annual Meeting and Awards Luncheon by her father and two of her teachers form Point Option High School. “The Point Option School program offers a unique opportunity for students to experience teaching and learning in a non-traditional way.” Quite exciting! Congratulations Rachel! You write beautifully! We hope you continue to write about our precious outdoors. Our second place winner, Marciana, is an 11th grader attending Norview High School’s specialty program: the Leadership Center for the Sciences and Engineering in Norfolk, Virginia. She enjoys participating in field hockey, martial arts, and tennis, and is a member of the National Honor Society and Spanish Honor Society. In her free time, she loves being with her family, as well as writing and playing music. She hopes to further her education by going to college after high school, but is still unsure on what she will pursue. Congratulations Marciana, wonderful writing! No matter your career choice, we hope you will always continue to love and write about the outdoors. It was a pleasure having you and your family at our Annual Meeting. Congratulations to our third place winner Joseph Owings, a home schooler from Madison County! This talented young man is the middle child in a family of five children. Joseph is in the ninth grade and enjoys fishing, hunting, and running track. A young man of strong faith he also loves to write. Keep up with your fine writing and love of the outdoors! Wonderful having you and your family members with us for our Annual Meeting, celebratory luncheon, and awards ceremony. Prizes were presented to the winners during our 2018 VOWA Annual Meeting held March 24, 2018 at the DoubleTree Hotel, Charlottesville, VA.
Dubby’s Fishing and Hunting graciously sponsored this year’s High School writing competition by providing generous cash prizes of $150, $100, and $50 to our 1st, 2nd, and 3rd place winners respectively. Our sincere appreciation to Dubby’s for their support, THANK YOU! We also thank Dominion Energy for a grant that played a big part in enabling VOWA to offer a wonderful celebratory and informative Annual Meeting and Awards Luncheon to our members and award winners from our Collegiate, High School, and Excellence-in-Craft Contests. Judges for this year’s competition were Davida Carnahan, Gregory Fuhs, and Lesley Elser of the Bureau of Land Management. We thank them most sincerely for their time, patience, and expertise in judging our contest. Thank you also to Myron Brubaker for chairing our 2017-18 High School Essay Contest, and to Matt Schwartz, VOWA’s Executive Director for his assistance with so many of the contest details. Congratulations to all who entered. You are all winners to us! Keep enjoying, writing, and caring about the outdoors.